The Valletta Pageant of the Seas at night. During the Valletta Pageant of the Seas night performance, a number of components were used to deliver a spectacular night performance that illuminated the Grand Harbour, with the night programme staring at 9pm. 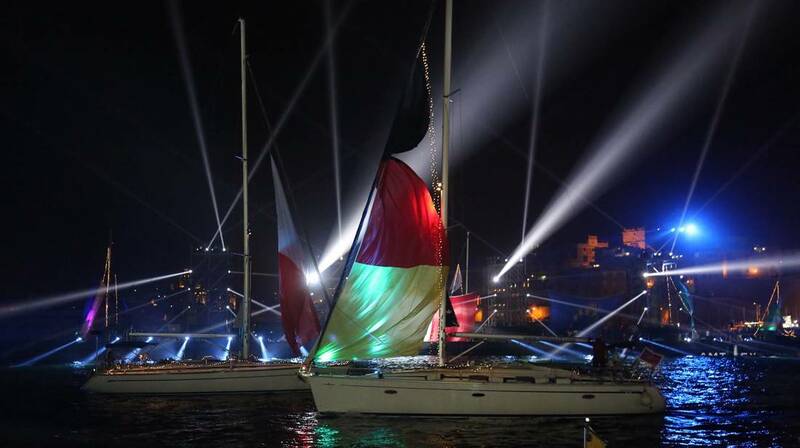 28 yachts lit up with lights, carrying flags of the European member states, were displayed brightly as they entered the Grand Harbour from the Kalkara yacht marina, surrounding the stage that was anchored in the middle of the harbour aboard a large barge. Following this nautical display, a choir gave a preview of the upcoming Valletta 2018 opera Aħna Refuġjati by singing a piece from the production, which will be taking place at the end of August and the beginning of September, later this year. A water curtain also featured in the night performance with audio-visual projections projected onto the water, followed by a performance developed in collaboration with Barcelona-based artists La Fura Dels Baus. The performance saw a luminous tree being split open and the gigantic female figure of the Venus of Malta arising from the sea and lifted in the air with local acrobats trained by La Fura Dels Baus performing on the structure. The night culminated with a fireworks display over the Grand Harbour.